Volcanic eruptions are the most spectacular natural events, except for asteroid impacts. Some of them are so beautiful that seeing them is one of the most justified ways to risk your life. If you are sure you are ready to play "Russian roulette" with Nature, just read the following text and wait for your chance to step over a fence with a warning sign on it. After all, as a Zulu saying goes, "A man of courage dies only once; a coward dies every day". Warning: getting close to erupting volcanoes can result in extremely painful injury or death. swifts from nesting in crater walls. The main problem with volcanic eruptions is that they occur rarely and unpredictably, mostly in remote parts of the World. Some of the most interesting volcanoes are in Central Africa, Antarctica, Oceania or the Russian Far East. Many produce spectacular activity, but with very long gaps: most of the volcanoes of the Caucasus, for example, erupt once in 7-20 centuries; the supervolcanoes of the Rocky Mountains wake up every 100,000-500,000 years. Europeans are more lucky, because they have two very active volcanoes in Italy. Etna is famous for producing large lava flows every few years, while Stromboli erupts every few minutes (or, sometimes, every few hours). Both are easy to climb, although it is often windy and foggy on their summits. Iceland is known for less regular, but very interesting eruptions. Kilawea, Hawaii, 1998 For Americans, the most popular place to watch volcanic activity is Kilawea Volcano, Hawaii. For decades it has produced spectacular lava flows almost non-stop. The flows from PuuOo crater often enter the ocean just a few miles from a paved road. Updates on Kilawea activity can be found here. For observing more violent activity, Volcan Arenal in Costa Rica is a good place. It erupts every few hours, mostly at night. Climbing Arenal is forbidden, so you have to do it late at night, or try to walk around the ranger station through the jungle. Although night climbing is more dangerous, the tree-fern forest on the slopes is very dense and covered with volcanic ash, so it is very difficult to break through. A good idea is to pass the ranger station at night and continue your climb at dawn. (2004 update: the activity has decreased a lot compared with the 1990-s, and is not worth the climb anymore). Lava ball, Arenal, 1995 The main source of danger on Arenal are huge (up to 25m/85' in diameter) balls of hot lava. They "drop" from the edges of lava flows and roll down the steep slopes very fast. It's a good idea to keep to higher places and small ridges while climbing Arenal or other volcanoes. This Montezuma oropendola (Gymnostinops montezuma) was mimicking the sounds of volcanic explosions. 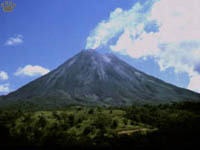 Volcan Arenal, 2004. Kamchatka Peninsula in Russia has more than 40 active volcanoes, some of them very interesting or unusual. The main center of activity is the Klyuchevsky Group of seven huge volcanoes in the north-eastern part of the peninsula. Two of its members, Bezymyanny and Shiveluch, are famous for extremely violent explosions. Tolbachik volcano (not visible on this picture) was the site of the splendid Great Tolbachik Fault Eruption in 1980. The Kamchatka Volcanology Institute is located in Klyuchi village inside the Group; it is an interesting place to visit before climbing any of the volcanoes. Kamchatka, Russia Klyuchevskoy Volcano, known to Russians as Klyuchevskaya Sopka, is the highest peak in northeastern Asia. When I climbed it in 1988, it was 4750m (15,830') high. In 1992, it was 4800m (16,000'), and keeps growing ever since. As you have to start climbing at 15 m (50') above the sea level, this climb is a good survival test. In the 1980-s the main danger was the rocks melting out of glaciers in midday and rolling down. The summit crater was on top of a hill at the bottom of an older crater, so there was almost no danger of lava blocks falling down on a climber's head. 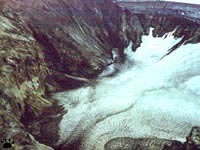 In the 1990-s, the constant activity of summit and side craters has greatly reduced the glaciers and covered them with ash. The top hill has overgrown the surrounding crater rim, so lava and bombs can roll all the way down to the so-called Bombardment Tundra in the foothills. Although climbing Klyuchevskoi becomes more and more dangerous, the award for climbers is a fantastic view of the crater and the unbroken panorama of Kamchatka, Pacific Ocean and the Sea of Okhotsk. Klyuchevskoi, Kamchatka As the shape of Klyuchevskoi changes, it is more and more difficult to find a sheltered place to spend night near the summit. Keep in mind that all depressions around active craters may contain "pools" of carbon dioxide, a lethal gas capable of passing through a standard gas mask (you can get a special filter for it for such a case). Much more common around active volcanoes, geysers, and hot springs is sulfur dioxide, but it has strong smell and almost never reaches deadly concentrations. By the way, it's much more dangerous to become an amateur volcanologist if you have any respiratory or heart problems. Another group of Kamchatka's volcanoes, east from Kronotskoe Lake, is famous for its geysers, dry calderas and crater lakes. The most active here is Karymsky volcano. It erupts very often (you can tell it by its regular shape untouched by erosion), but it is impossible to climb during eruptions. It was almost inaccessible when I visited it in 1989, but now it's regularly visited during helicopter tours to Geyzer Valley. Kamchatka, Russia, 1988 Other wonders of Kronotsky Group include Krasheninnikov Caldera with 6 craters nested in each other, beautifully shaped Kronotsky Volcano, black tar lake on Glavny (Main) Semlyachik and sulfuric acid lake on Maly (Lesser) Semlyachik. The latter lake changes its color every few years: in the 1970-s it was white, in the 1980-s it turned green, and now is reportedly blue. All these volcanoes and Uzon Caldera are easy to see from a helicopter on a Geyzer Valley tour, but you have to arrange it with the pilots prior to takeoff. A hike to the volcanoes and the Valley takes 2-4 weeks, is extremely difficult due to lack of trails (there's plenty of bear trails, but they are difficult to follow), and is not always possible due to changing restrictions (most of the area is a part of a huge Nature reserve called Kronotsky Zapovednik). Swimming in crater lakes, always check the water first, and never get far from shore: there can be very hot springs at the bottom, some of them periodically active. In this lake on southern Kuril Islands, a few people have been killed by sudden explosions of boiling water from the bottom. Giant brown bears frequently visit hot springs and lakes of Kamchatka and Kuril Islands. Kamchatka, Russia Geyser Valley is by far the most famous place on Kamchatka Peninsula. It is small compared to Yellowstone, but has higher concentration of geysers and hot springs with more variety of weird-colored mineral deposits. Unfortunately, most of its wonders are not close enough to the helipad and cannot be seen on a regular one-day tour. Further upstream, there is seldom visited Valley of Death. Due to high concentration of carbon dioxide on its floor, this valley is sometimes full of bear and wolverine corpses. The most beautiful volcanic crater I've ever seen was the main crater of Mutnovsky volcano in southern Kamchatka. You entered it through a narrow canyon to find yourself in an alien landscape: hills of sulfur, swamps of acid, and lakes of boiling mud, glowing at night. Three icefalls were dropping in from a large glacier on the crater rim. One of these icefalls was bright-blue, another was covered with red surface moraine, and the third one was golden-yellow from sulfur deposits. Sulfur formations, Mutnovsky crater Active fumaroles in the crater constantly ejected huge volumes of boiling water, steam and sulfuric oxide. Some rare and beautiful minerals crystallized around fumarole openings. Molten sulfur formed giant columns, arches and mushroom-shaped hills in the crater. They used to grow and fall apart rapidly, so every few days the crater bottom changed its appearance. Unfortunately, this unearthly beauty was mostly destroyed by 1997-2002 eruptions. 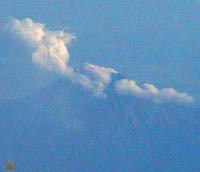 Gorely (Burnt) volcano is another member of Mutnovsky Group. It is a long rocky ridge with eleven craters. Five of them have glaciers inside, and two have lakes. Approximately once in a decade, one of the craters erupts. 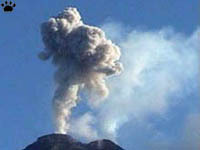 But the eruptions of Gorely are usually brief, from a few hours to two weeks. A hike along the ridge of the volcano is a good way to see different types of craters in one day. Vilyuchik Volcano, Kamchatka, Russia The high plateau between Mutnovsky, Gorely and Vilyuchik volcanoes is locally known as "The Museum of Natural Disasters". Earthquakes, eruptions, avalanches, rockslides, snow- and duststorms are so common here that the entire area has never been inhabited by people. Neighboring fjords are periodically hit by tsunamis and flash floods. The plateau is now crossed by a dirt road leading to a geothermal power plant at Mutnovsky. Avacha is the only volcano on Kamchatka easily accessible in winter: it is just above the main city of the peninsula. For decades, hundreds of people climbed it to see the beautiful golden Vesuvius-style crater. Its 1991 eruption fell on a weekend, and I just happened to have some spare money, so I took the next flight from Moscow. A flight across Russia takes 10 hours, so by the time I climbed Avacha, the lava was already cooling down. Avacha volcano, Russia, 1991 The most impressive part of this eruption was not its visual effects, but its sound: you needed some ear protection a few miles from the crater, and at the summit it was far above pain level. I learned two things on this eruption: first, always take earplugs; second, never approach an eruption site on plastic skis. They'd be eaten away by the invisible layer of abrasive ash on the snow. Wooden skis would last much longer. Walking around volcanic craters, try to avoid the areas covered with fresh lava shrapnel and volcanic bombs. I didn't know it on my first eruption site, at Ebeko Volcano on Kuril Islands, and almost got killed by a sudden explosion. I had two hard hats, and I put them on while trying to escape red-hot rocks raining down. Both hats were broken by the time I ran away from the blast zone. Cauliflower-like clouds above the crater may look safe at first, but later they can collapse and turn into a rain of stones or a boiling pyroclastic flow spreading around at hundreds miles per hour. 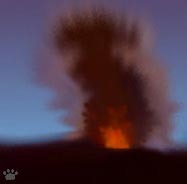 Mauna Loa, Hawaii Some eruptions last for years, even centuries, but others are over within hours or, sometimes, seconds. If the eruption is over, or there is a pause in activity just when you get there, don't be upset. Seeing a good eruption is a prize for which five-six attempts is not too much. Volcanic areas are always beautiful; some of the World's best Nature reserves are on volcanic slopes. Just forget about the money you've spent, relax and enjoy the scenery. Probably the most beautiful feature of volcanoes between eruptions is crater lakes. You can see all possible colors: dark blue (such as in Golovnin Caldera on Kunashir, Kuril Islands), turquoise (Maly Semlyachik), green (Poas and Irazu in Costa Rica), white (Ebeko), yellow (Cutoff Head in Ussuriland), black (Pyaktusan on China/Korea border), red (a scarlet lake had existed a few decades ago in Anak Krakatau), bright-golden (there is one in an unnamed crater on Kunashir), silver (Mono Lake in California) or purely transparent (Crater Lake, Lake Taal in the Philippines). Tajikistan Visiting some places requires the same preparations and precautions as seeing volcanic eruptions, although those places are not related to volcanism. Good examples are mud volcanoes of Caspian Sea coasts, or the famous fire caves of Anzob Gorge in Tajikistan. These caves lead to burning coal layers deep underground. The coal has been burning for thousands of years (the place was mentioned by Herodotus), so cave walls are decorated with unique mineral deposits. But to enter them you need all kinds of protective equipment: the temperature inside can be high enough to burn paper. 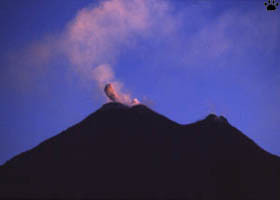 Bad weather can be a serious problem during eruptions. Volcanoes are often high, isolated mountains, and they seem to cause cloud formation around their peaks, even when it is clear elsewhere. An eruption itself, of course, can decrease visibility even further. During a trip to the Philippines, I've spent two days on Volcan Mayon, which was supposed to erupt. But the mountain remained hidden into clouds, so I couldn't see it, and didn't even know if it was erupting or not. Finally, on the third day, I got a few seconds of relatively unobstructed view of the summit, with a smoke column rising from the crater. The actual eruption didn't occur until a few months later, and was, reportedly, very spectacular, with lava fountains up to 300 m (1000') high. Washington, USA Currently I am in a good position for an eruption-chaser: Hawaii, Mexico, the Lesser Antiles and the Cascades are only a few hundred dollars away. Eruptions occur rarely in North America, but they can be very spectacular. The main problem is access closures, as authorities in this country always try to take care of your safety for you even if you don't want them to. So, prepare for night hiking and long climbs!